142km, 10C. Good wind and little rain. Slept in my tent. 80km, 15C. Bad wind and rain. Was invited to sleep in someone's home. 110km, 5C. Headwinds all day. 105km, 15C. Sun all day. 92km, -5C. Good wind and nice weather. Slept in my tent. Tuesday 20/3 White River- Wawe. 95km, -25C. The weather changed fast today, cold, warm then cold again. Slept in house. 80km, 5C. One car drove me back to the same place where my tyre burst. I slept in a cabin. 100km,-5C. Nice weather, but bad winds. Slept in the same hotel today. Was invited to go out with people from a bike club. Me and the police bike patrol. 120 km, 5C. Bad wind all day. Biked with 2 police bike patrol all day. Stayed in a police officer's house. 105 km, 5C. Bad wind all day. Slept in a garage. 135 km, 15C. Nice wind, sun and hot all day. Was so nice, had forgotten how warm weather feels. Stayed in a house of the father of one of the policemen. Relaxed, a bike club showed me around the city. Stayed over with one guy who had biked around the world. We had a lot to talk about. Relaxed, bike club had a benefit for me with beer and good food. Enjoyed my time here. Friday 16/3 Thunder Bay- Nipigon. 150km, -5C Bad wind all day. Slept in tent. 108km, +5C Sun all day, Slept in tent. Police take care of me. I had the pleasure of the company of two bike patrol officers and one police car for a short time. Many accidents with trucks have happened along here. The police enjoyed listening about my trip, so they biked with me for fun. Also, they found places for me to sleep on the road and very often in other police officers' houses. I found them very friendly. 90 km, -25C. Very bad crosswind so I found myself walking. A nice lady gave me a motel room and food. I was also invited to play curling for the first time in my life which was great fun. 85 km,-20C. Some bad winds today. I got a free room in a hotel today, hot tub.... Luxury!! 70 km,-15C. Wind is a little bad, but the scenery is nice. The last 2 months of biking was over flat terrain with much snow and desert. Now...there are many lakes, rocks and trees, it is very beautiful. A cycling policeman escorting me to Kenora. (I think the police are afraid of long haired bikers) I've been invited to stay with a Danish family and tomorrow we are going ice fishing. Relaxed, ice fishing today and I caught one fish. Fun. Relaxed, was ice fishing all day, I caught a trout. A bike store here is repairing my bike. I gave lectures at two schools for younger children today and it is very fun interacting with kids. They ask about everything and get very excited! 86km, -5C. It is beginning to be much warmer now. I've had the company of a police biker, Hotse De Jong and slept at his house. 102km, 5C. I think this is the warmest day I've had in Canada. It is so nice to feel sun and warm weather. I still have the company of a police biker who is "sceptical of long haired bikers." Slept at the police officers house. Biked from pub to pub all night long. I was biking all night on a pub crawl with some of the guys from the Woodcock cycle store. 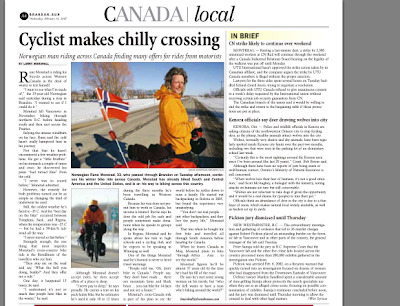 Monday 26/2 Winnipeg I will be here until Sunday, I've been invited to the Norwegian symphony concert which will be fun! So now I hang around and live with people from Scandinavia. Met the Norwegian Ambassador on Wednesday and he invited me to stay in his house in Ottowa. Most of the time I have been relaxing here and spending time meeting people. I've been invited to many places, Museum, airport control room, dinner....all of which is very nice. I spoke to a Norwegian Club as well as to people who have been in ice biking competitions. In the evening I was invited to an Icelander Club dinner. Relaxed, worked on my bike today. Will stay here for a while, work a little and I have been invited to the Norwegian Symphony Orchestra at the end of this month. Must go to that. Relaxed, have been invited to a dinner to speak lecture to a group of people and to go out with guys from woodcockcycle who are crazy on their bikes. The conductors know me well. The conductors know me well. Every time they see me they blow their whistles. My first frost burn. I got a lot of good food in Canada to. 45 km, -25 C. A little bad wind today. One lady stopped me on the road and invited me for some "Lefse" (a Norwegian food) and also to stay in her house. Couldn't say NO to that, but it was a short trip today. 130 km, -33 C. Crosswinds today, but sunny. Invited to stay in house. 110 km, - 30 C . Nice weather. 55 km, -20 C, Nice weather. Invited to stay in a house, hot tub and swiming pool. 60 km, - 20 C, 50 km/h side and headwind today. This was one of the hardest days of my trip. The Scandinavian Club has been taking care of me here. I think I'll stay here for a few days wher I've been invited to many things. Should be fun. Relaxed, met people from the Scandinavian Club. I was interviewed by the tv, radio and newspaper today. It is so much fun that people are interested in my trip. Relaxed, invited to stay with the President of the Norwegian Club. Regina, speaking about my trip. 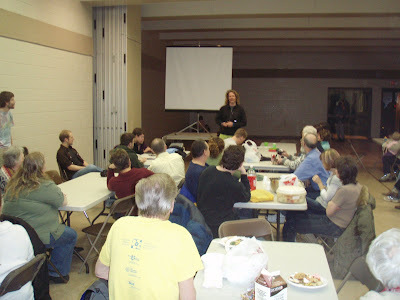 Spoke with some people today and had a potluck supper - everybody brought food. Relaxed all day. Lectured to a Community School as well as a doctor and his son who I met yesterday. They offered to fix my bike because the handlebars were too low which was hurting my wrists and shoulders, so they rasied them. They also gave me headlights, a tail light, new pedals and new winter studded tires. To think, I biked for an entire year with low handlebars! Now I can sit up easier when I bike! Another lady gave me foot warmers. I also went to a nature museum - some of it even looked like Norway. We also went tobogganing in the middle of the night. It was fun and there was a lot of snow. Lectured at a highschool for a group of teachers as well as the pupils. I never thought that I would be lecturing teachers. Fun to meet so many people! The people who I've been staying with gratefully a pair of much needed new pants. Invited to a hockey game in Moose Jaw and Regina won 6-3, looked like war again - I guess they must be rivals. Still waiting for my pad. Relaxed. Got my pad back. 65 km, -25. Good wind and sun. Invited to stay in someone's house. 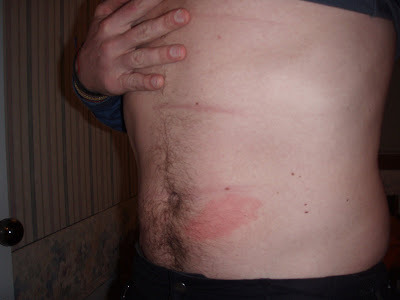 Got my first frost burn on my stomach because I pushed myself too hard and started to sweat which can be dangerous when it's this cold. It was a really stupid thing to do. Saturday 10/2 Indian Head- Whitewood. 95 km, - 20 C. Sun and nice weather. Today was one of the best days of my trip. I felt like I was flying! Got a kick out of that. One lady stopped me on the road...is to dangerous. 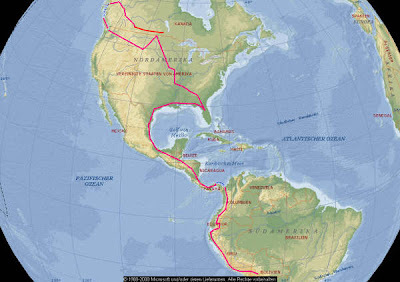 This map shows how far I have traveled on my bike. 146 km, -5 C. Good wind and nice weather. Slept in park. Monday 29/1 Tompkins- Swift Current. 77 km, - 13 C . Much side wind, but nice weather. Slept in house. One lady stopped me on the road and didn't want me to bike anymore. She said that it is too dangerous, she wanted to give me ride. I said no thank you, but had to talk to her for 20 minutes before she let me go. Anyway, she called the police and they came. This has actually happened to me many times now. The police man said he will send an e-mail to all police stations along the road and tell them about me, let them know I don't need help if someone calls. It is a nice little story. I got flat tire number 106 today, I asked one man if I could fix my tire inside his house. Too cold outside. Relaxed today. A lot of Skandinavian people live here, I was invited to dinner with some of them and talked about my trip. There were about 20-30 people and it was fun! Two of the people are from the same village where my mother grew up in Norway. The world is not so big, really. 80 km, -15C Sidewind. Invited to stay with a farmer, he has 1,000 head of caddle. 150 km, -23 C. Very good wind behind me all day. This day is one of my best days on my trip, felt like I was flying. I got a kick out of it. Was invited home by a pastor. Will stay here a few days, I have a problem with my pad and have to wait for a new one. The pastor I am staying with here has been helping me out. 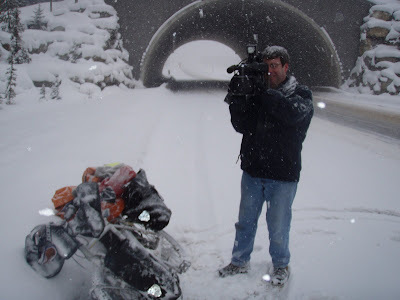 I was invited to speak to some people tomorrow about my trip and winter biking, I think it will be fun. Spoke to about 40 people and it was fun. Some of these people invited me home and said I could stay with them until I get my pad back. Flat and no snow here right now. 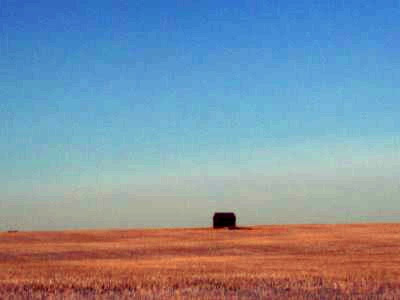 Medicine Hat - Really flatland and no snow here right now. 60 km, +5 C. Nice weather and wind. Slept in tent. 130 km, +8 C, Nice weather and wind. Invited to sleep in house. Wednesday 24/1 Brooks- Medicine Hat. 115 km, +8 C, Little bad wind. Biked 5 hours in the dark which sometimes I like as it is different. Slept in the park with my tent. A newspaper here helped arrange a hotel for one night. I will also be giving a talk to some people tomorrow in Starbucks Coffee shop at 6 pm. Chilled out for most of the day. Talked to some 15 - 20 people about my trip in the evening, which was great fun. One of them invited me home and also fixed my bike for me. (look at credits link) . I was invited to a hockey game today, which will be the first hockey game I have ever been to. Medicine Hat won 7-2. Looked like a war out there, fighting and black eyes. They also announced my name in this game so I had to stand up. Was fun. Invited to a party in the evening. Thoroughly enjoyed my time here. Me on T.V in Calgary, Alberta. Relaxing in Calgary where met many really nice people. Invited to a party, viewed art and also saw a stand up comedy show. I was invited to stay in three different houses. Biking in Banff, Canada in a storm. While biking on the Icefield parkway I discovered this video feature on my camera which is my very first movie. The tempature was -20 degrees celcius and the winds were high. The highway was closed twice due to avalanche control. It was GREAT fun!! Monday 8/1 Icefield Parkway-Lake Luise. 35km, -10 C .Nice weather and much down hill cycling. 60km, -5 C. A lot of snow, but I had a good wind behind me. Met a man at a bike store who gave me a place to sleep. 25km, -10 C. bad wind today, storm. Met a doctor and she fixed my badly damaged feet and also gave me a place to sleep and food. 115km, -28 C in morning, -20 at daytime. Sun all day and good winds behind me all day. Dr Susan gave me the adress of her sister in Calgary, I will stay there tonight. My bike is much too heavy, so I must clean it. My tent is 4 kg and really I don't need such a big tent which is making my bike to heavy (40kg) and which naturally slows me down. I am still meeting such nice people who invite me home, such friendly people here.